Cafe High On Life is more than your typical cafe. A space that is bustling with activity, games, hobby classes and, of course, great food, this spot is a great place for some much-needed me-time or to connect with friends and family. In a bid to create a comfortable space for customers to just come in and do their thing, Cafe High On Life is an adorable little cafe with its mossy green and bright red exterior complete with a white picket fence. Set at a corner in Ramamurthy Nagar, this place offers more than just your regular brew and a quick bite. With guitar classes, painting workshops and more, there’s plenty of activity to get involved in. Or if you’re looking for some quiet time, bring a book along to get lost in, or a sketchbook to fill with doodles, as you tuck into sandwiches, burgers, shakes and even fruit-based pani puri (which is apparently a big hit with the cafe’s patrons) in this cosy setting. The prices are incredibly reasonable and fall between INR 50 to INR 120. 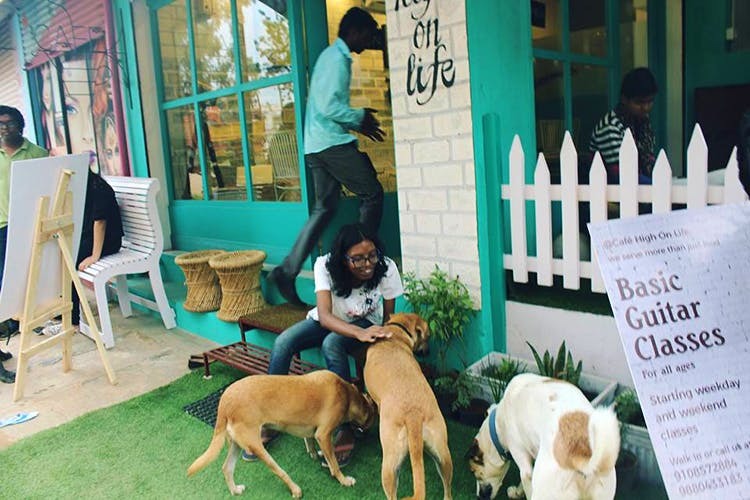 Barely a couple of months old now, Cafe High On Life was started by behavioural trainer Rajathi Subramaniam, who wanted to create a space for people and families to connect. The cafe also aims to create a personal space where people can just let their creativity flow and engage in activity that makes them happy. Something troublesome on your mind? Sign up for a quick counselling session with professional experts here too and leave feeling a little lighter. If you’re signed up for their other classes, these sessions are absolutely free. Otherwise, you’re charged a nominal fee of just INR 100. See you there! The space is pet friendly, so take your pooch along with you for some quality time.